One of the advantages of owning your own superyacht shipyard, is that when you want to undertake a refit on a former navy vessel to turn her into a family yacht to travel the world on, the answer from the yard will of course be yes. 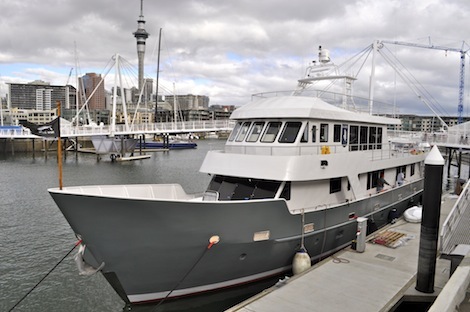 This is what Peter White-Robinson, owner of New Zealand based yard Fitzroy Yachts has done. With his wife Sharon and their two sons Cole and Finn, the couple and a group of family friends set off from Auckland today to undertake a two and a half year tour around the world on board their converted yacht, MV Kahu. The yacht is named for the kahu, an Australasian harrier and abundant native bird of NZ and the word also means cloak in Maori. 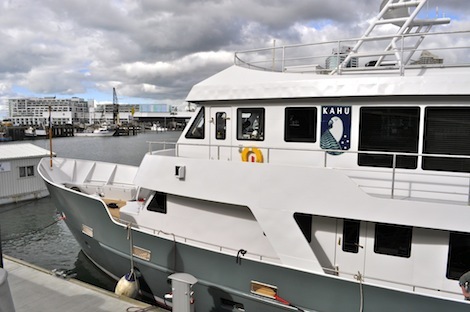 One of five ex Moa class inshore patrol vessels of the Royal New Zealand Navy, Kahu was refitted by the White-Robinson’s in a year-long refit project to become what will be the family’s home until 2015. 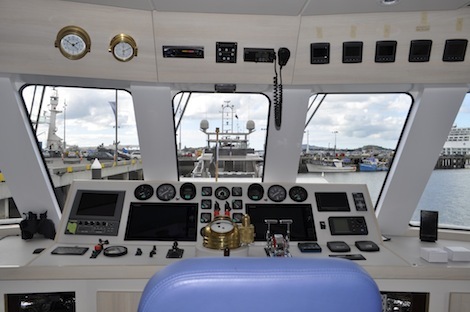 The yacht is now fully equipped: “We added a lot of equipment like a sewage treatment plant, water makers, a third generator, stabilisers, bow and stern thrusters and an extra anchoring system. We’ve upgraded all the electronics and GPS, radar and we have a whole different suite of instruments up there in the bridge,” said Peter. Most importantly, considering the travel itinerary planned, her fuel capacity was upped from 13,000l to 32,000l giving an 8000 mile range at 8 knots. “The navy listed their range as being 1300 miles so we have a much better range now,” he said. 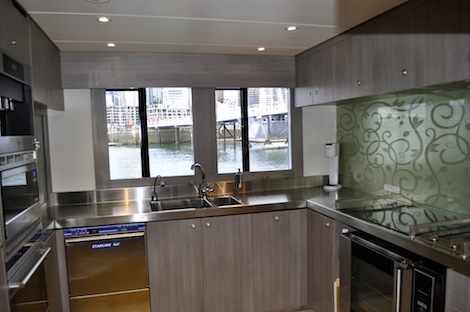 With the refit complete, Kahu is a light, bright and airy family boat. 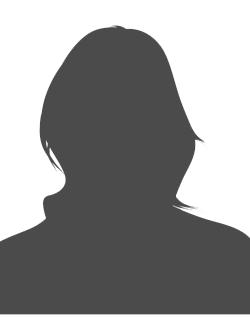 Sharon undertook the interior design herself, with consultation with Peter. “Between us and the joinery team, once they knew the wavelength I was on they could bring all their experiences to the design,” said Sharon. 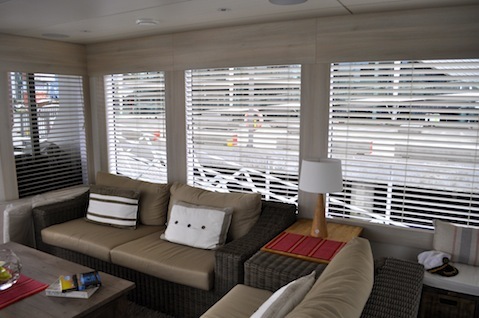 The palette has been kept quite neutral and clean with bleached woods and timber blinds, all complemented by the huge windows, which let natural light in throughout the yacht. 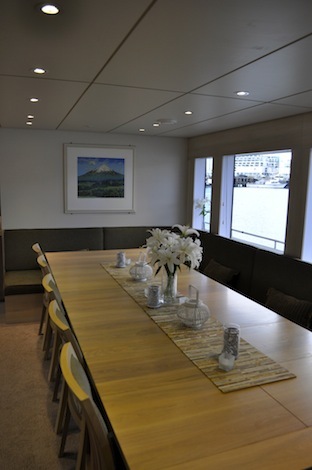 “The team were really good, having built lots of superyachts. I had the idea in my head but they were really good about turning that into a reality,” said Sharon. “I think it was hard for the team to take several steps back from the superyacht level they are used to, but they’ve made a great job and we’re not complaining." There is accommodation on board for 16, all with the same neutral palette. 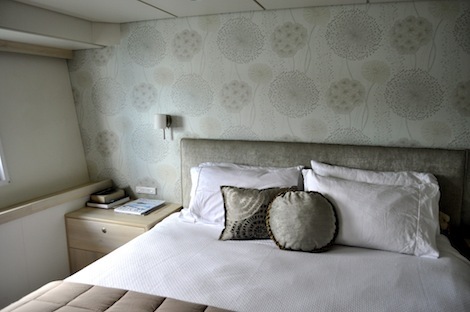 As well as the master cabin, there are two queen suites, a double and a twin bedroom. Their sons, together with the sons of two family friends who are joining them on the trip, have their own four-bedroom cabin with bunk beds. A sofa converts into an extra set of bunk beds should the boys have friends visiting. The trip has been timed around crucial periods of the children’s schooling, and while away they have a teacher on board and will be taught in a specially designed school room. 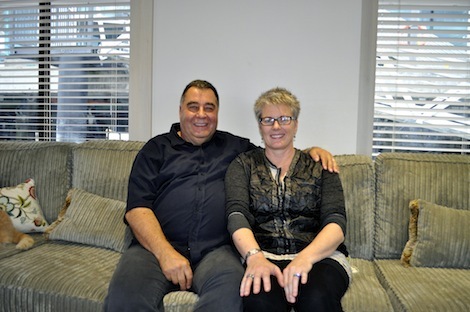 “We’ve tried to create quite a few different areas that people can have their own space in,” said Peter. 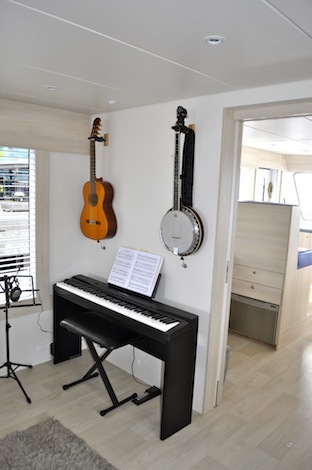 “Technically we’ll have 14 on board, and then quite often we’ll have guests – we’ve got quite a long guest list – as well,” said Sharon, who explained that because of this it was important to have several useable spaces that could be used and retreated to. 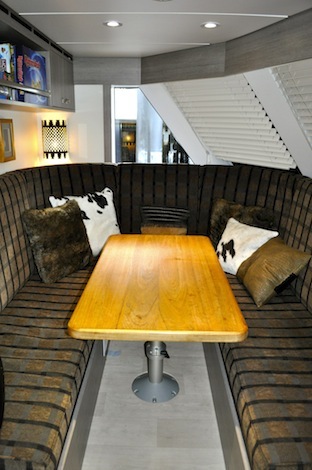 “We wanted to try and make it as homely as possible, we’re not formal people, and it’s not a crew guest divide yacht, half the crew is family and we all sit down and eat together so there’s no them and us.” True to the brief there are many useable spaces, including a den forward (which, with a day head in close proximity, can convert into an extra cabin if necessary) and two main lounge spaces as well as spacious deck areas.